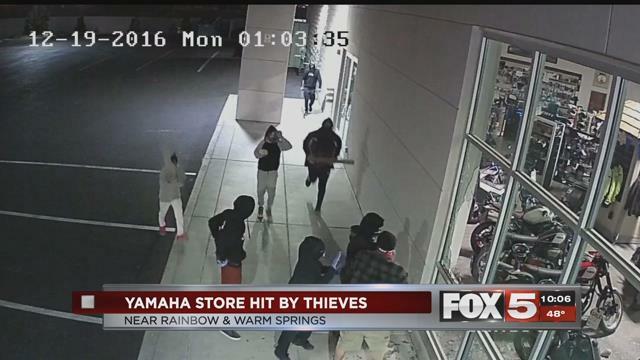 A gang of thieves was caught on surveillance camera as they smashed a window and made their way into a Yamaha dealership to steal dirt bikes. The burglary at Yamaha of Las Vegas on Jones Boulevard near Warm Springs Road happened in just two minutes early Monday morning. Eight people are seen gathering outside the store before several of the masked suspects threw rocks to smash a side window. Three of the suspects jumped through the window to get in. Seven bikes are then seen being taken out of the store. Timmy Key, a Yamaha manager, says the burglary cost the business $30,000 to $40,000. While seven bikes were wheeled out of the store, employees say four were actually stolen. The remaining bikes were so badly damaged they now can’t be sold, according to employees who released the video in hopes someone will recognize the thieves. “Some of them appear to be maybe early teens if not a little bit younger just based off of how tall they are compared to the bikes pushing around and it’s just sad that somebody’s setting that example for them,” Key said. This isn’t the first time the store was hit. A suspect vandalized the store in July and got away with about $100 worth of valuables. Key says this is the third burglary since May and by far the worst.